GALION — On May 13, Galion postal workers did a lot of picking up, along with their usual delivery service. Judging from the amount of goods that ended up at the U.S. Post Office in Galion, area resident did their part to help Stamp Out Hunger. Galionites could put non-perishable food items near their mail box for members of the National Association of Letter Carriers to pick up, or they could drop off goods at their local post office. Letter carriers, assisted by retired letter carriers, postal workers, friends and family then passed out the donations to area organizations for distribution. During the last 24 national food drives, letter carriers collected more than 1.5 billion pounds of food. Gary Miller | Galion Inquirer On May 13, Galion postal workers did a lot of picking up, along with their usual delivery service. 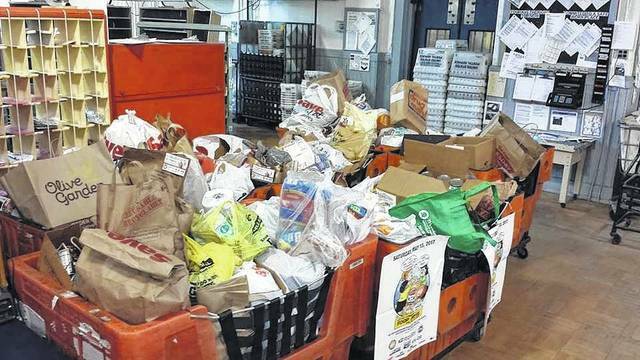 Judging from the amount of goods that ended up at the U.S. Post Office in Galion, area resident did their part to help Stamp Out Hunger. Galionites could put non-perishable food items near their mail box for members of the National Association of Letter Carriers to pick up, or they could drop off goods at their local post office. Letter carriers, assisted by retired letter carriers, postal workers, friends and family then passed out the donations to area organizations for distribution. During the last 24 national food drives, letter carriers collected more than 1.5 billion pounds of food. http://aimmedianetwork.com/wp-content/uploads/sites/38/2017/05/web1_stamp-out-hunger-2.jpgGary Miller | Galion Inquirer On May 13, Galion postal workers did a lot of picking up, along with their usual delivery service. Judging from the amount of goods that ended up at the U.S. Post Office in Galion, area resident did their part to help Stamp Out Hunger. Galionites could put non-perishable food items near their mail box for members of the National Association of Letter Carriers to pick up, or they could drop off goods at their local post office. Letter carriers, assisted by retired letter carriers, postal workers, friends and family then passed out the donations to area organizations for distribution. During the last 24 national food drives, letter carriers collected more than 1.5 billion pounds of food.